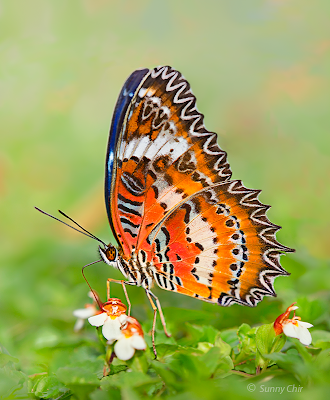 September 2014 is almost over as we look back at a month that was relatively quiet and uneventful. 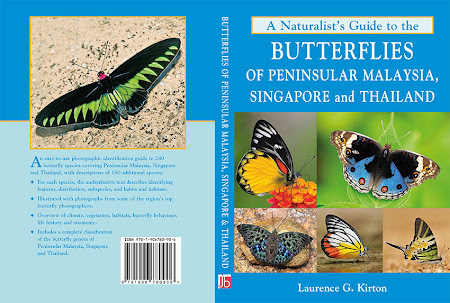 In Singapore, we had the Formula 1 Night race for the seventh time after its debut in 2008 as the first F1 night race ever. Other than the buzz created by the avid followers of the F1 circuit around the world, it would appear that the majority of Singaporeans went about their lives as usual. Besides some inconveniences for those working in the city, the event seemed to have even lost its appeal with the ordinary residents of Singapore. 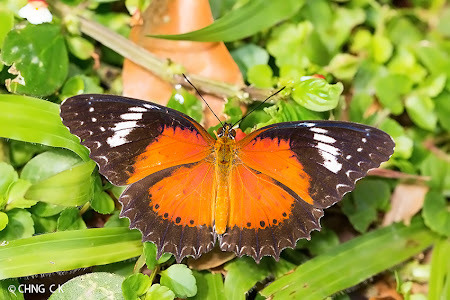 That Lewis Hamilton won the 2014 Singapore F1 probably didn't matter much to the man in the street in Singapore. Hogging the news, and creating quite a bit of a buzz in the local kopi-tiams (coffee shops) in Singapore, on the other hand, was a foreign national who was accused of misappropriating a wealthy Singaporean widow's $40M fortune. 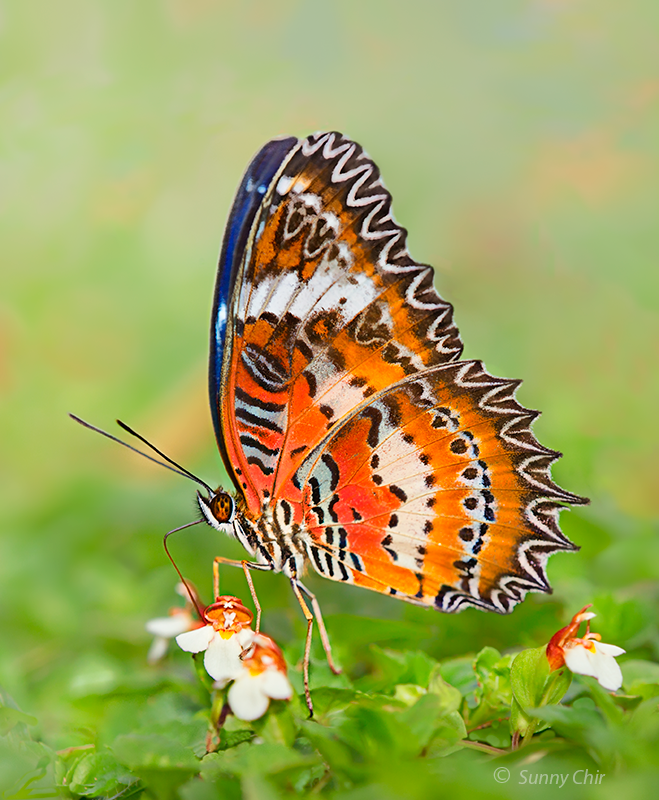 With a plot that is worthy of a TV soap opera, the accused apparently sneaked into the life of the widow and somehow managed to secure a Lasting Power of Attorney over her fortune. Social media was ablaze with anti-foreigner sentiment once again, as netizens began to question the legitimacy of how this individual, who possessed nary a requisite paper qualification nor the credentials, managed to become a PR in Singapore. 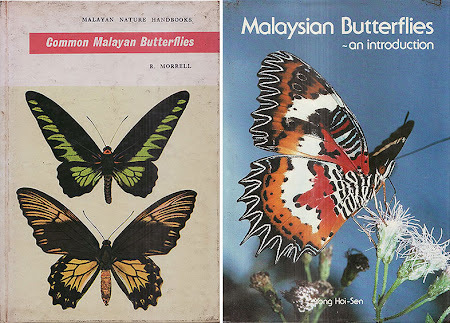 It will be interesting to see how the case plays out, as the plot thickens and even governmental organisations have lodged police reports and conducted investigations against the individual. 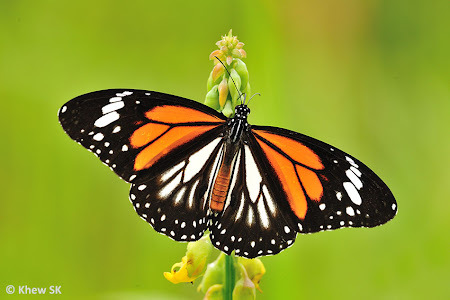 On the optimistic side of things, the unfortunate widow may have been spared the total loss of her fortune, although it would appear that part of her missing inheritance would be irrecoverable. 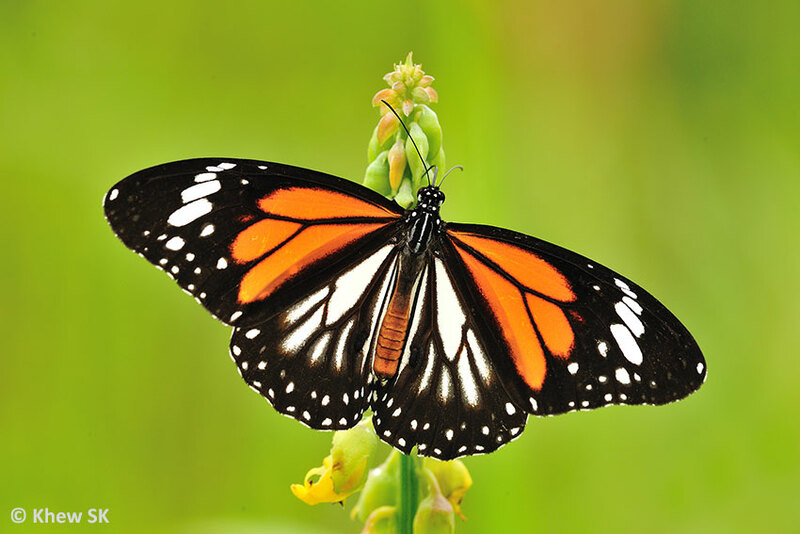 Over in Incheon, South Korea, the 17th Asiad is still being enthusiastically followed by sports enthusiasts. Singapore's local boy, Joseph Schooling ended a 32-year gold drought in swimming by finally winning a gold medal in his pet 100m butterfly event. Considering that Joseph is a born and bred Singaporean, the majority of the highly-critical netizens gave him a thumbs up for his wins in the swimming arena. 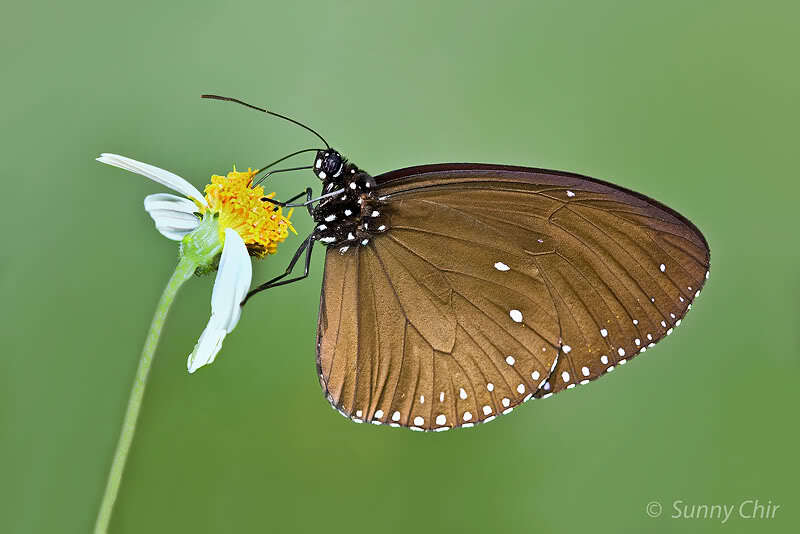 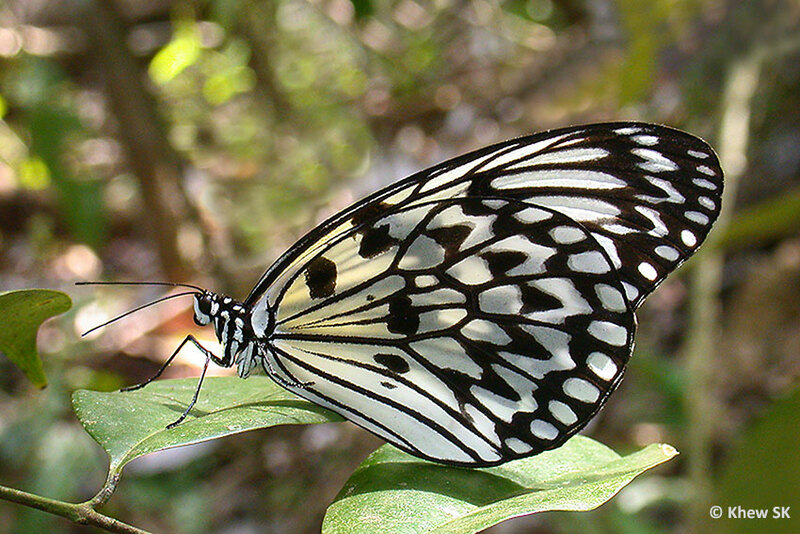 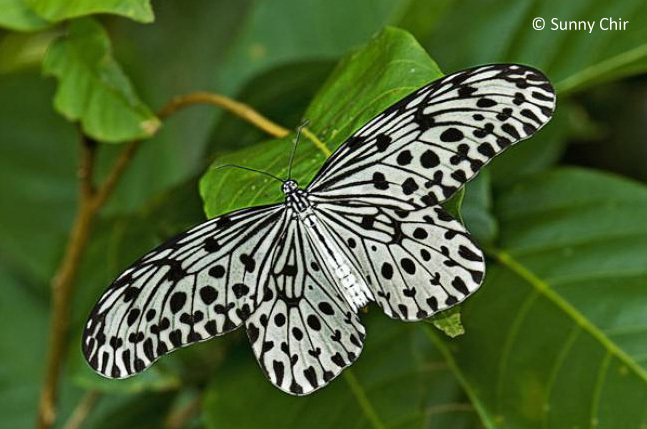 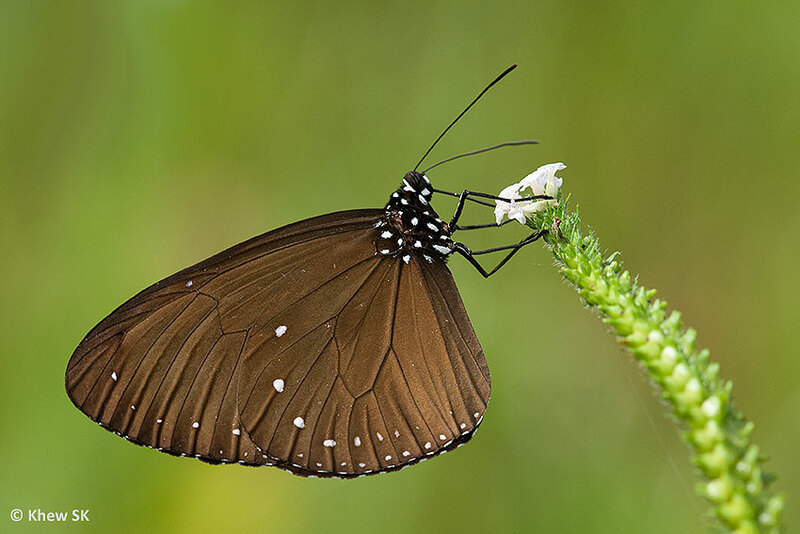 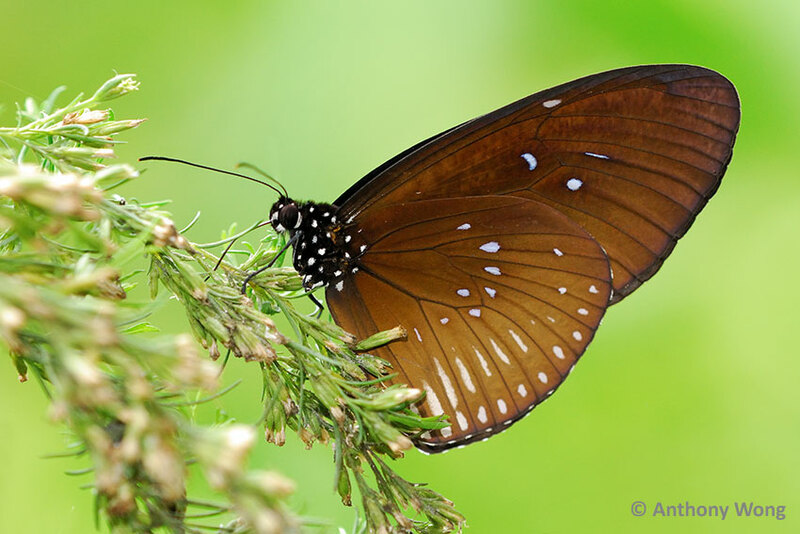 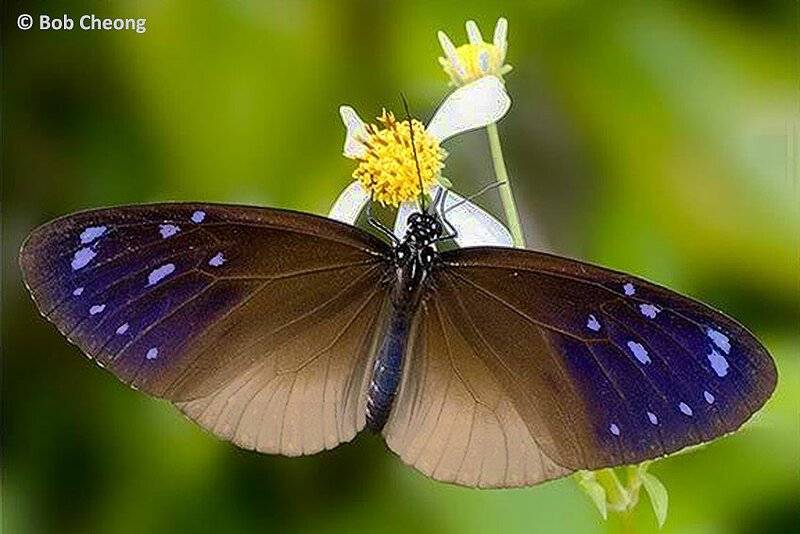 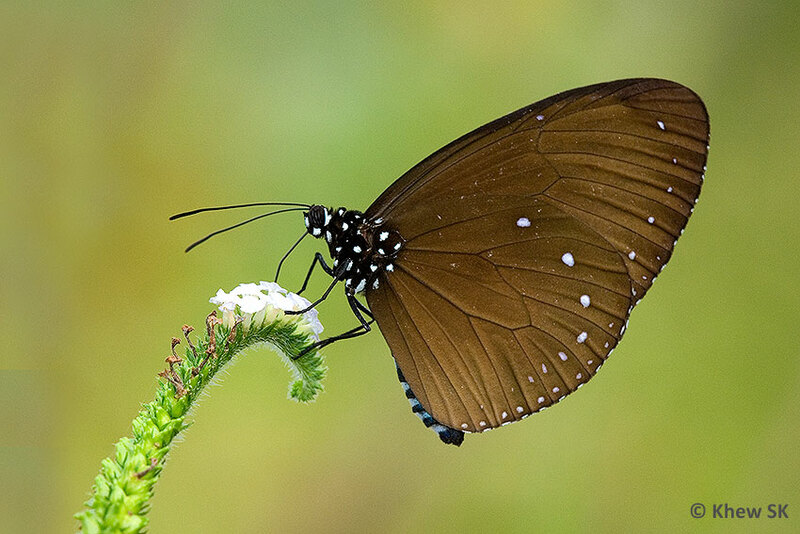 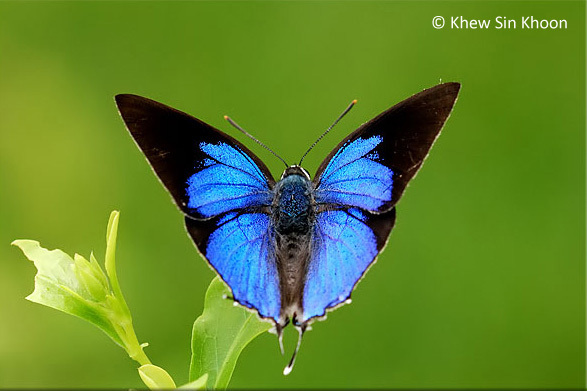 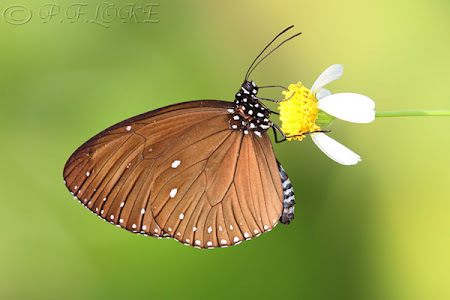 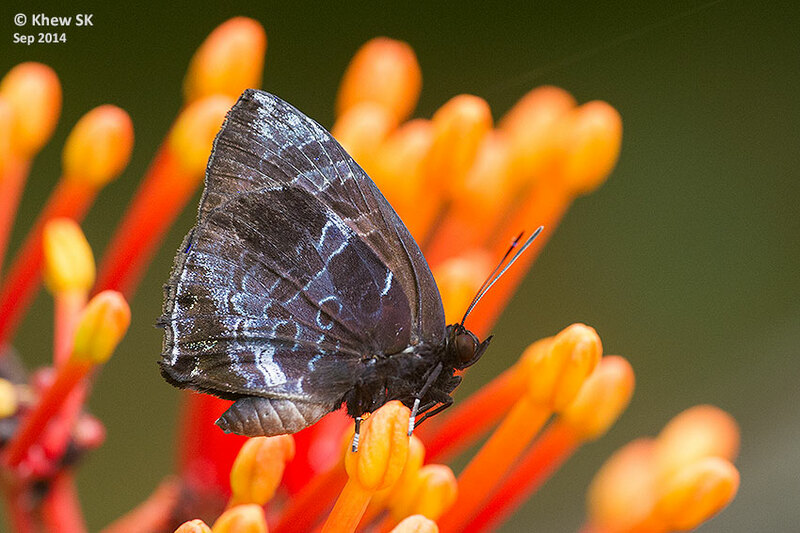 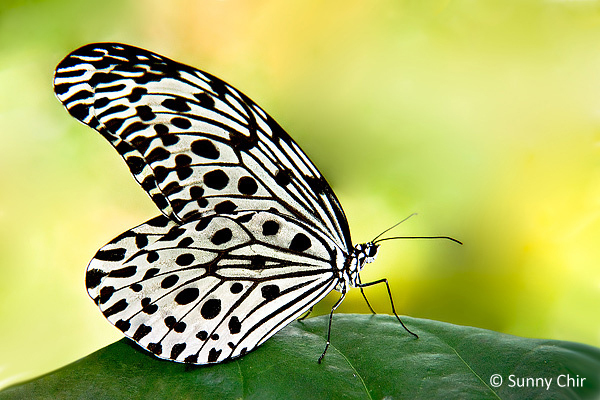 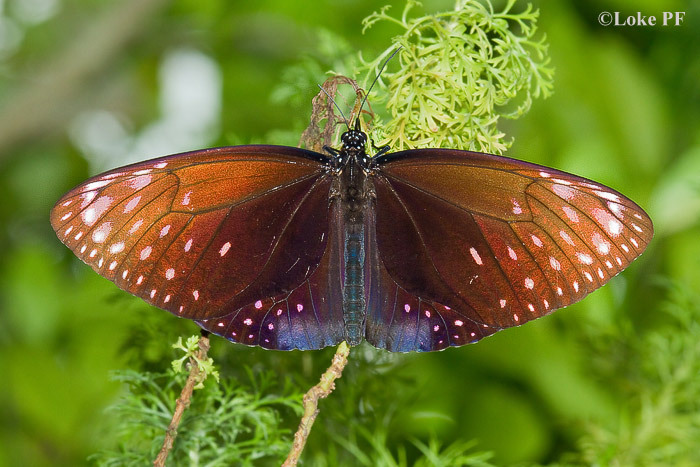 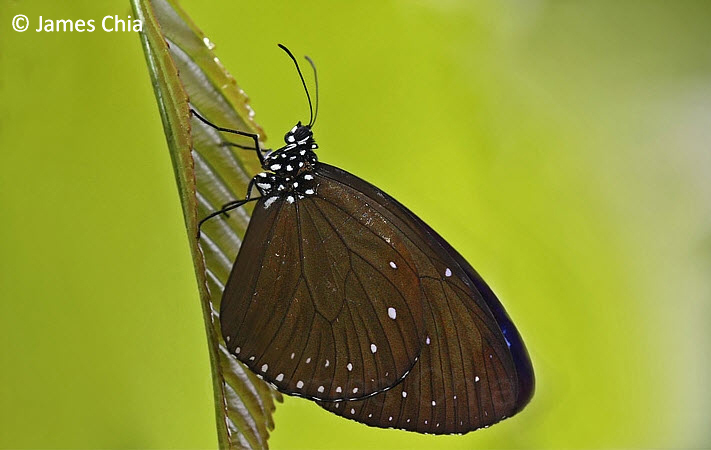 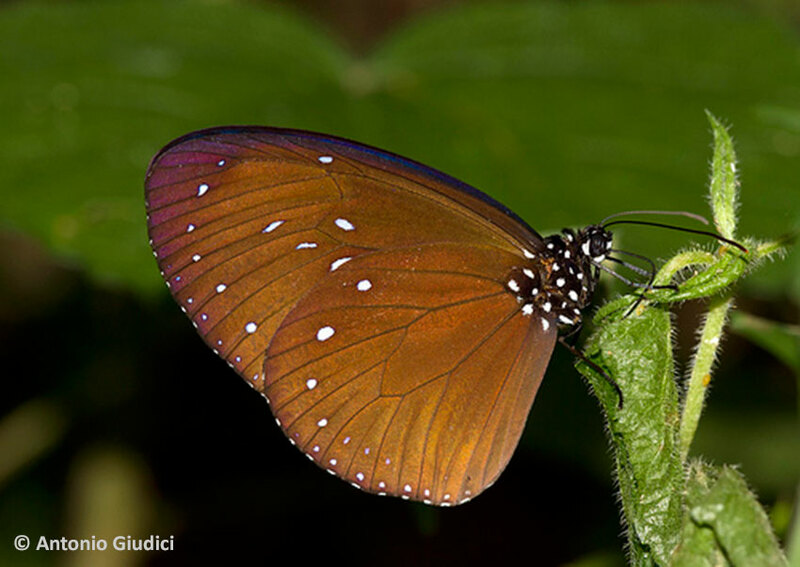 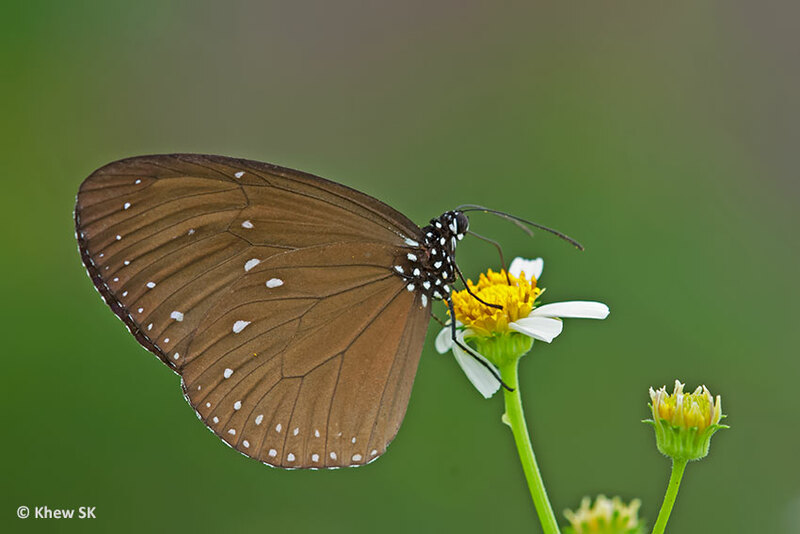 Our feature butterfly this month is the Dwarf Crow (Euploea tulliolus ledereri). 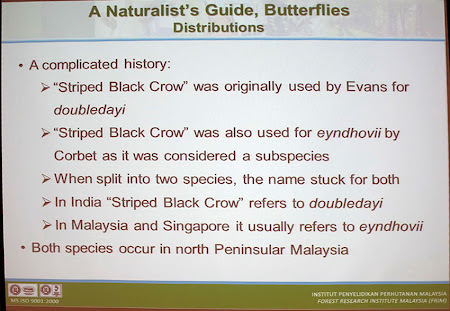 When it was sighted on the offshore island of Pulau Ubin back in 2002, the Dwarf Crow was recorded as a re-discovery for Singapore. 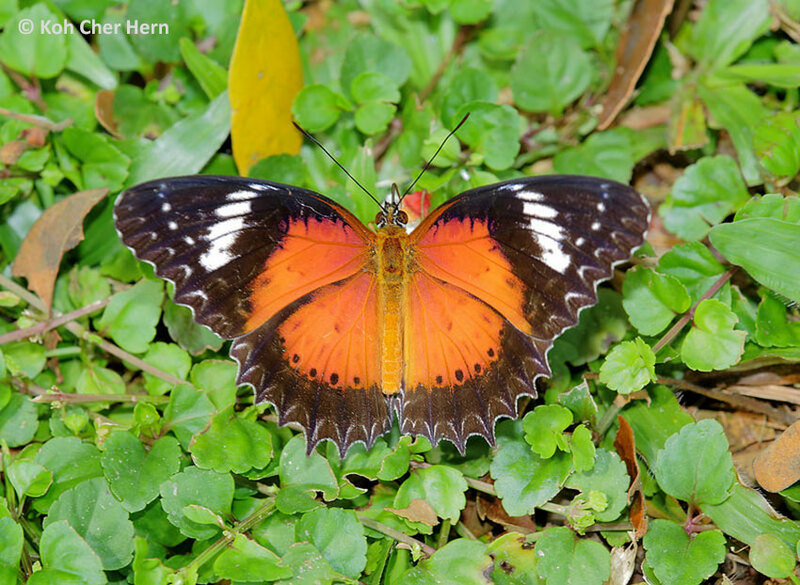 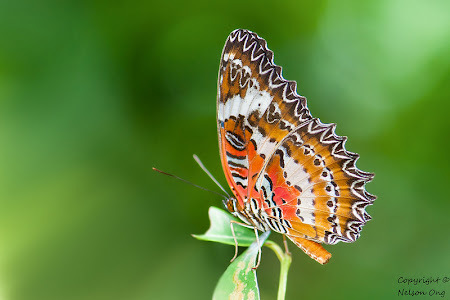 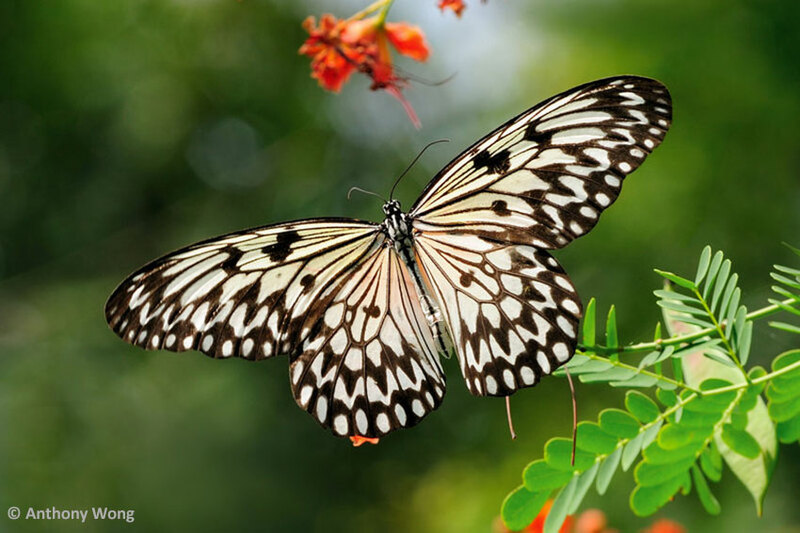 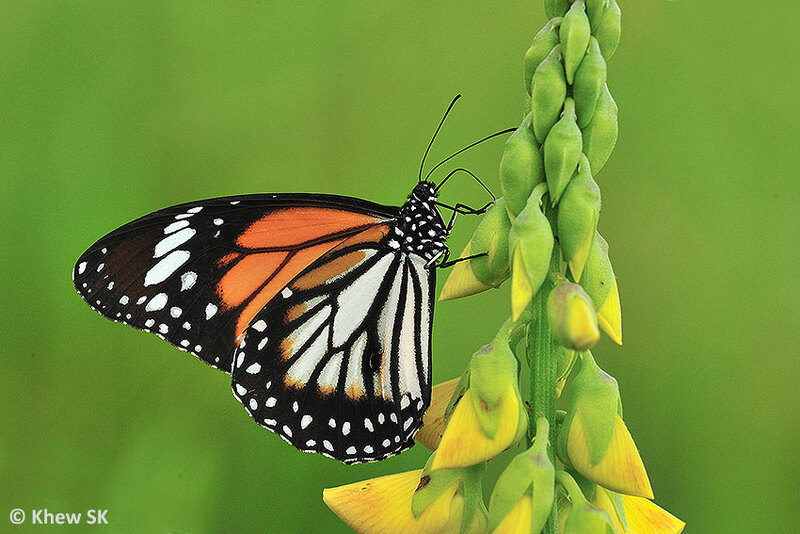 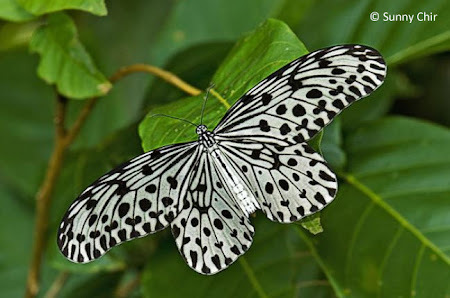 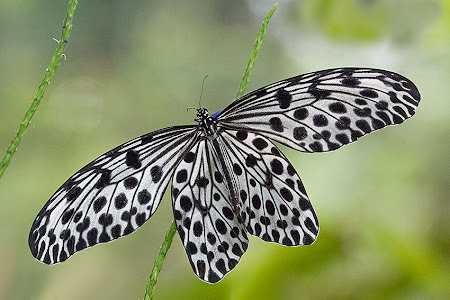 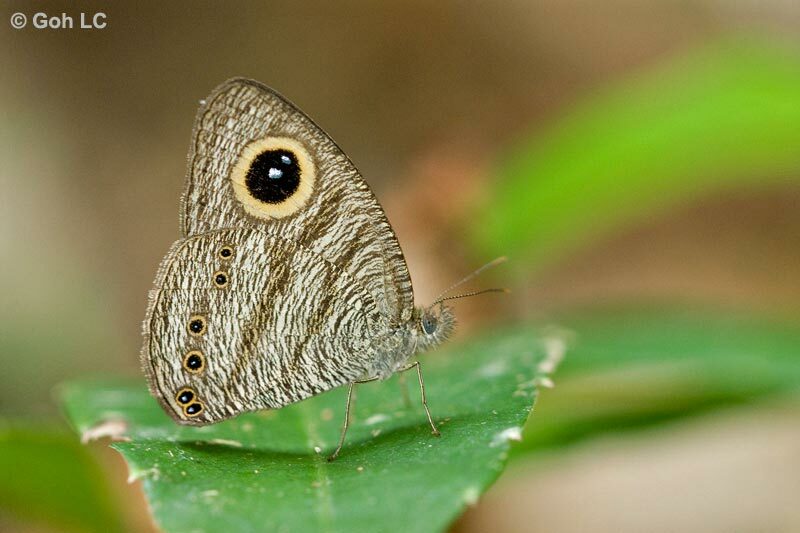 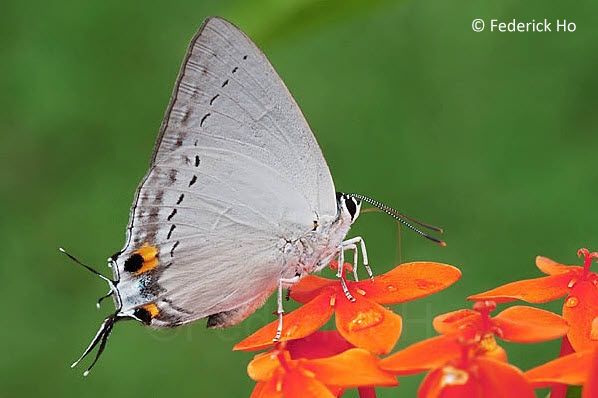 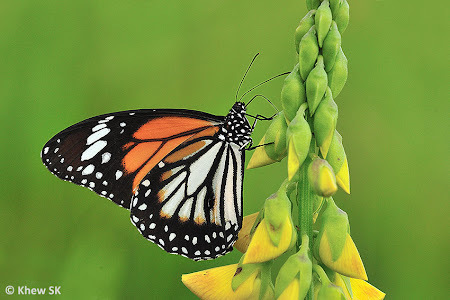 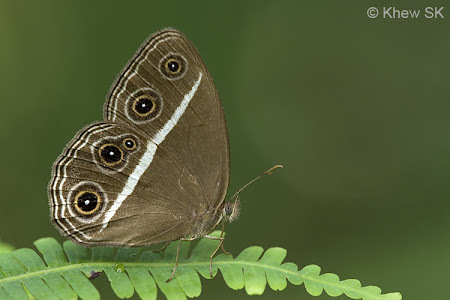 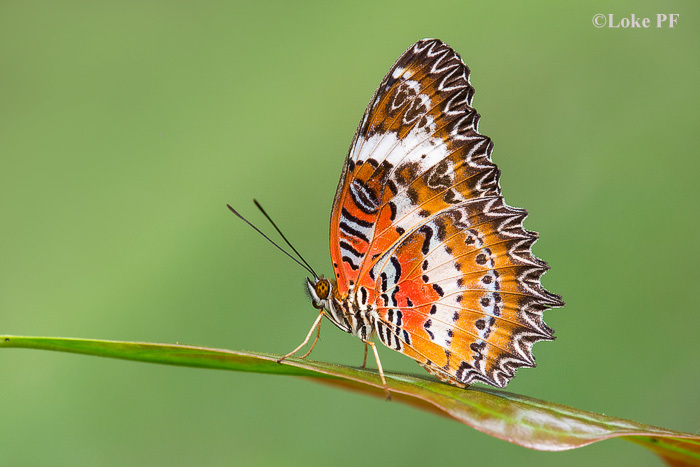 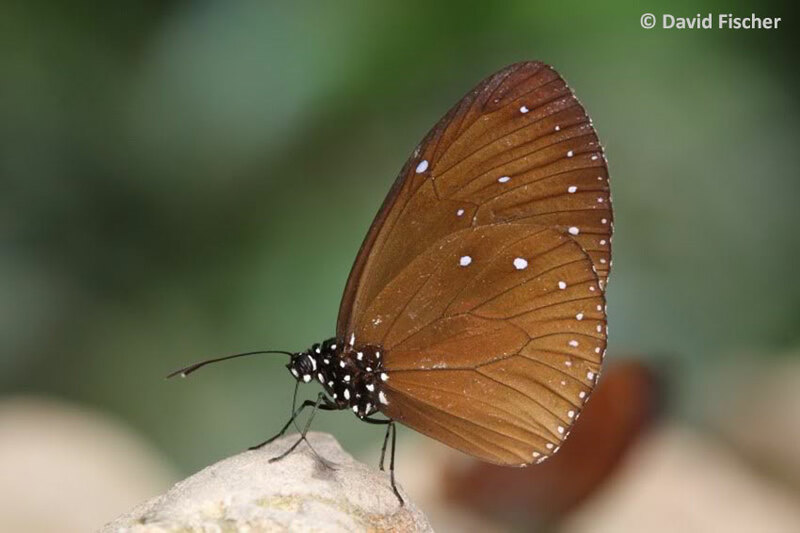 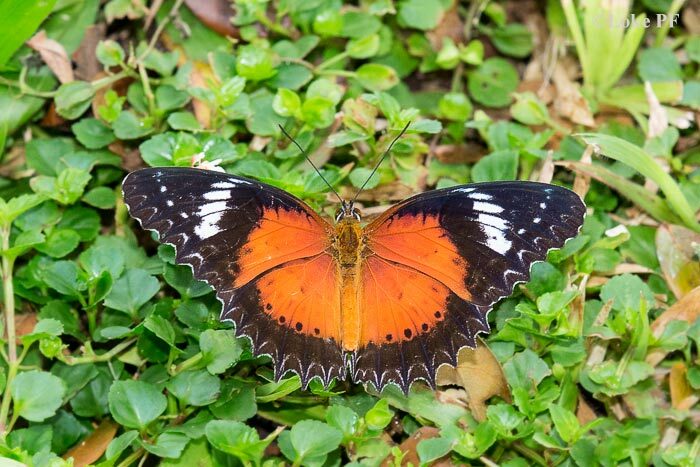 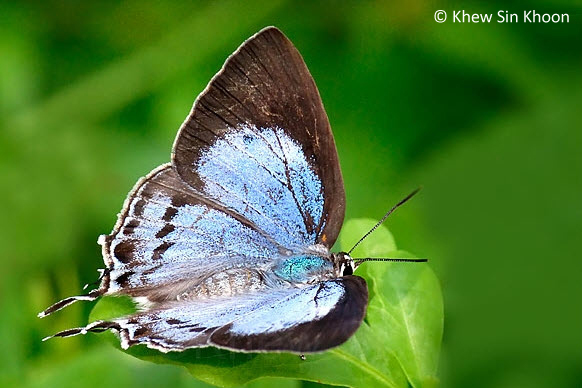 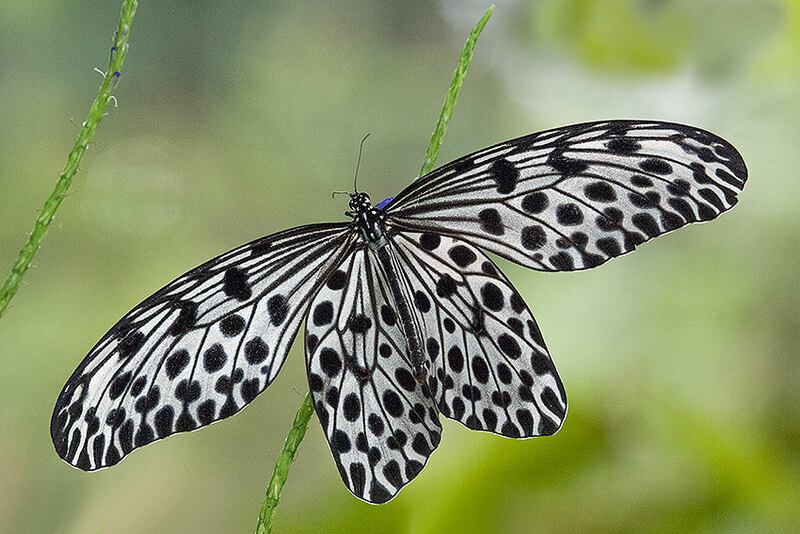 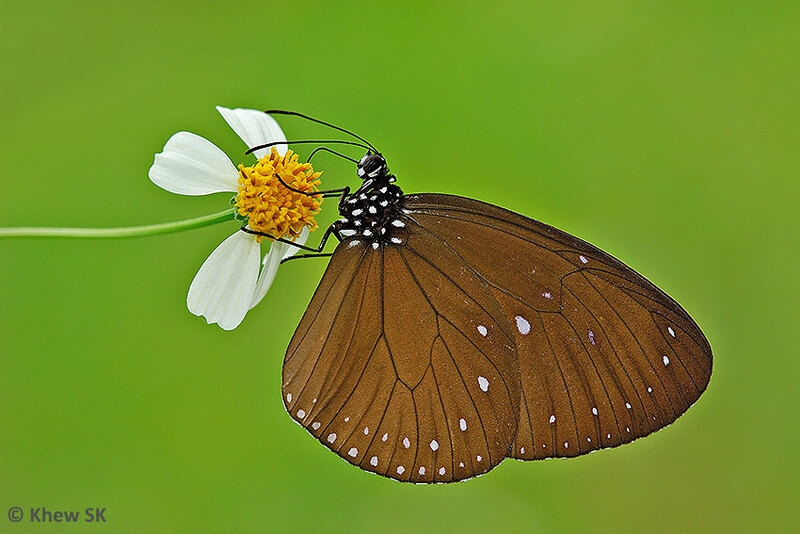 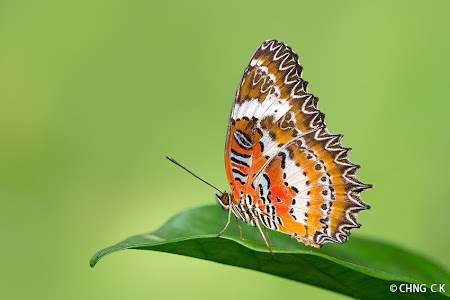 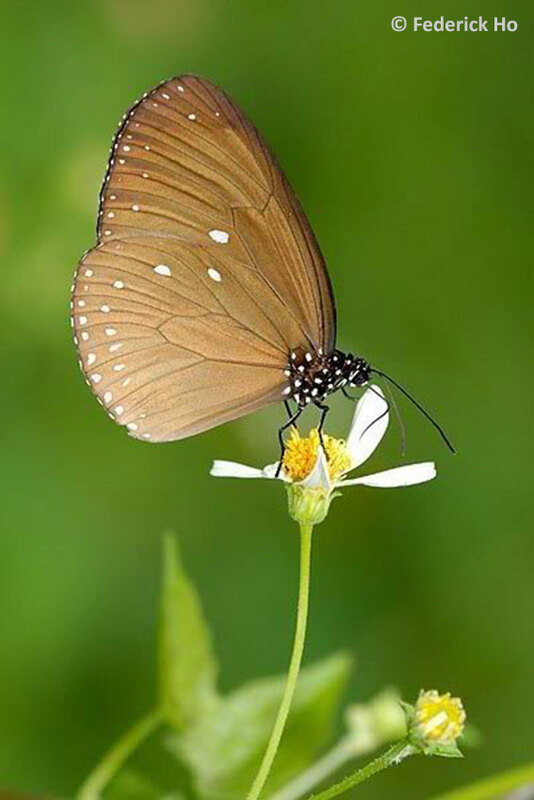 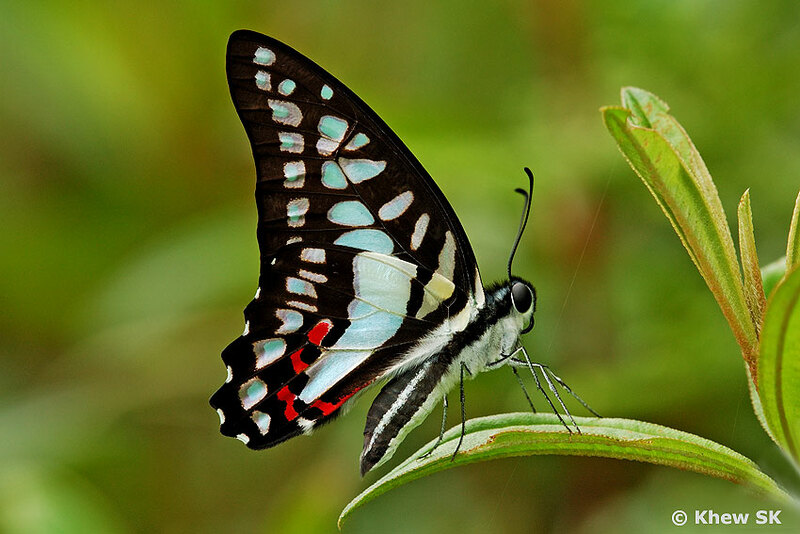 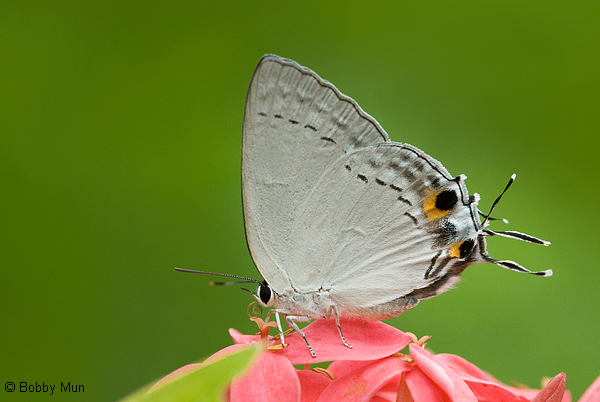 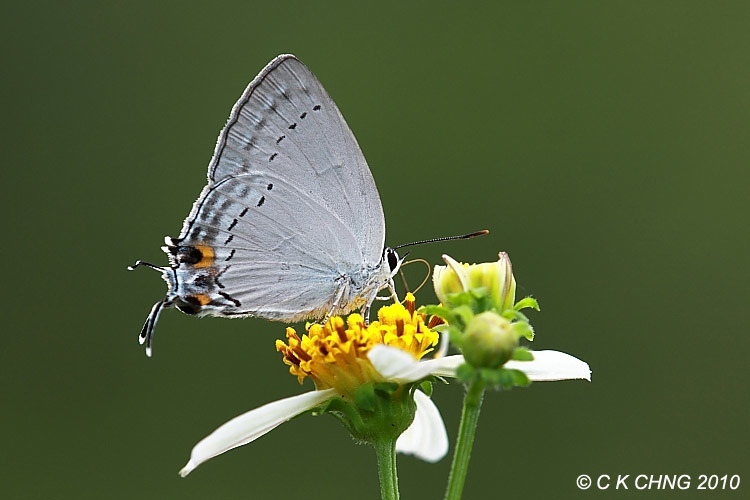 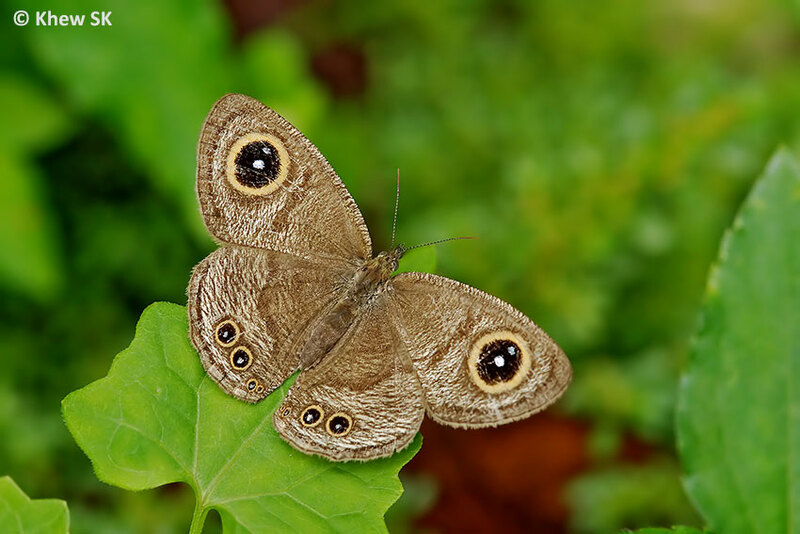 Though listed in the early authors' checklists, it had not been seen in previous surveys of the Singapore butterfly fauna since the early 1990s, and presumed to be no longer found in Singapore. Then it re-appeared. 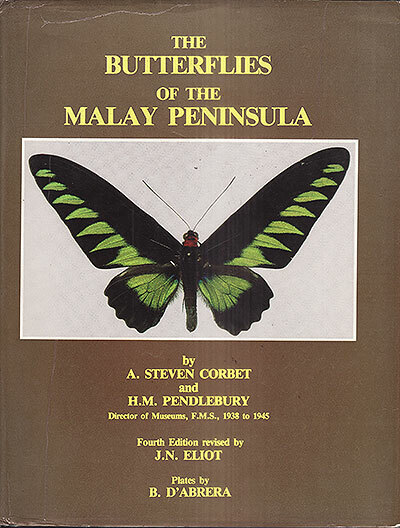 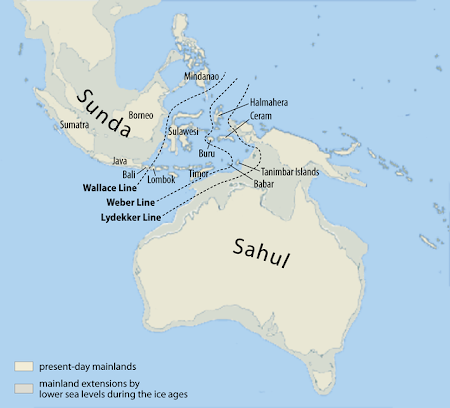 Even so, this species continued to be reliably recorded only from Pulau Ubin. 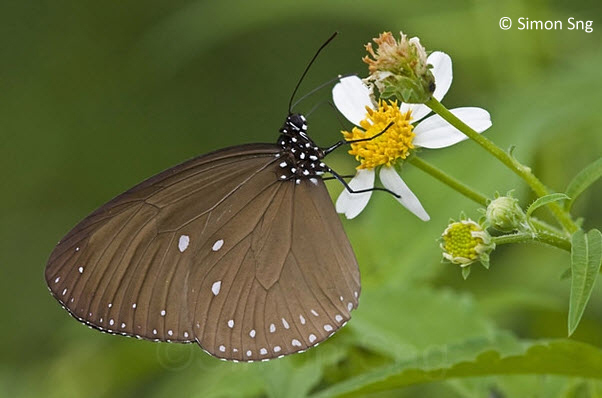 For a period of time, it was regularly spotted on Pulau Ubin, often feeding on flowers of the Indian Heliotrope (Heliotropium indicum) and other wild flowers. It was a frequent visitor to the Butterfly Hill on Pulau Ubin, although in recent years, sightings have become much rarer. 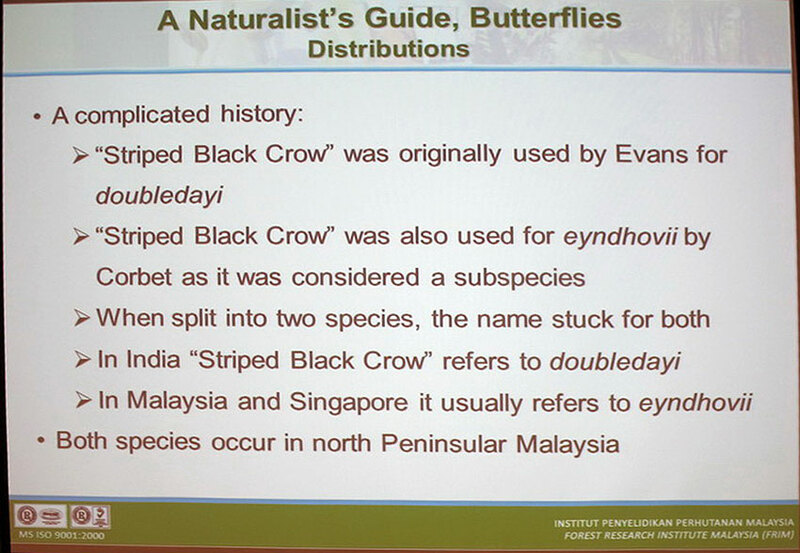 The Dwarf Crow is so named, probably due to the fact that it is the smallest sized species in the genus. Sporting a wingspan of only 50-60 mm, it is certainly smaller than the other "Crows" that are found in Singapore and Malaysia. The wings are reddish brown with the apical portion of the upperside of the forewings coloured deep blue with a few bluish discal and submarginal spots. The male's hindwings are unmarked on the upperside, but the female's hindwing features small diffused submarginal spots. The underside is a medium brown with the usual Euploea white spotting along the wing margins. 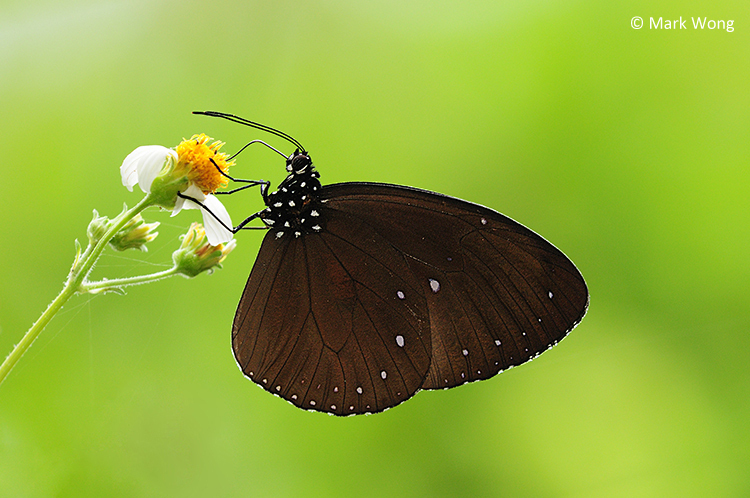 The Dwarf Crow is a slow flyer, usually seen flying calmly from flower to flower to feed. On Pulau Ubin, individuals of this species have also been observed puddling at damp spots as well as dried roots of some plants. 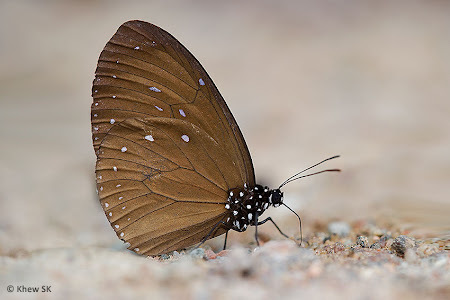 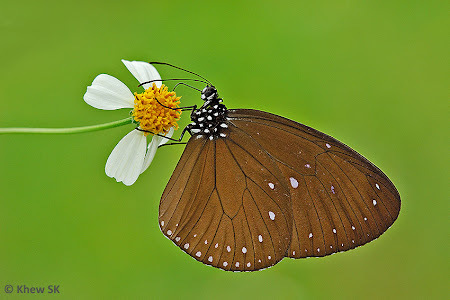 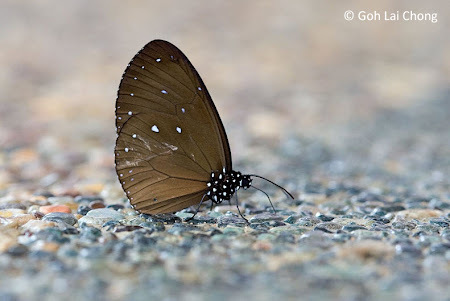 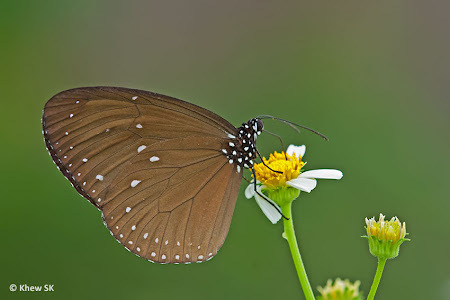 During a time when the Indian Heliotrope was found at certain locations, the Dwarf Crow was also recorded in the company of several other species of Danainae butterflies feeding on the dried parts of the plant. 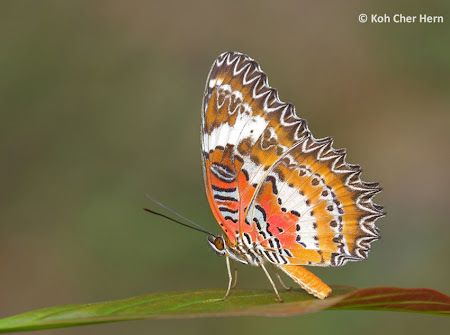 The subspecies found in Singapore is ledereri and this subspecies also flies in Malaysia and southern Thailand. 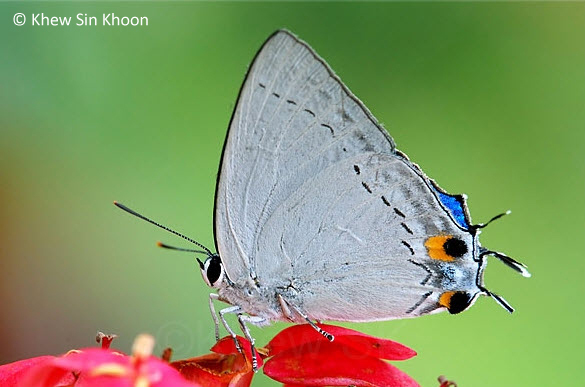 It is not uncommon in certain locations like the nature reserves in Endau Rompin and even on Fraser's Hill, where it is occasionally seen. 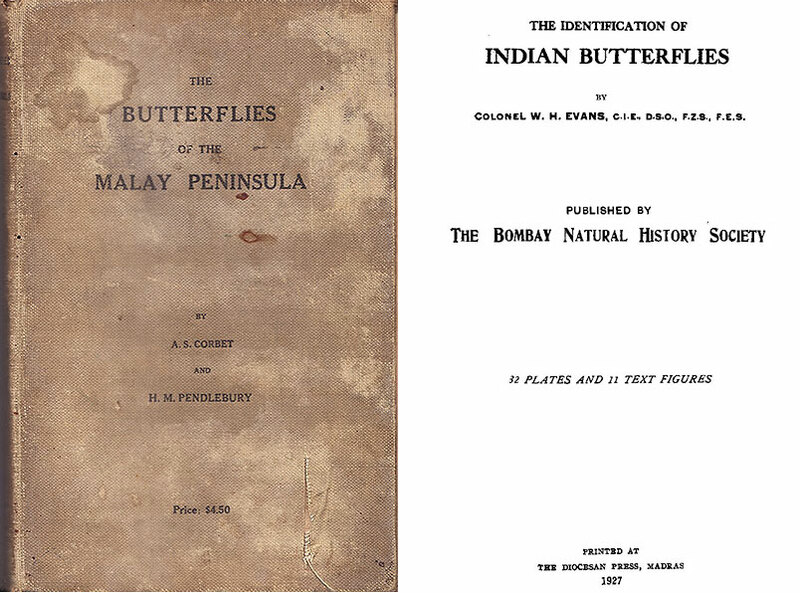 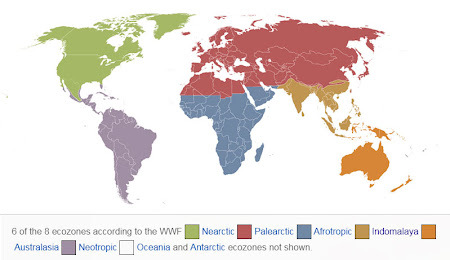 However, in Singapore, it is considered rare and very local in distribution. 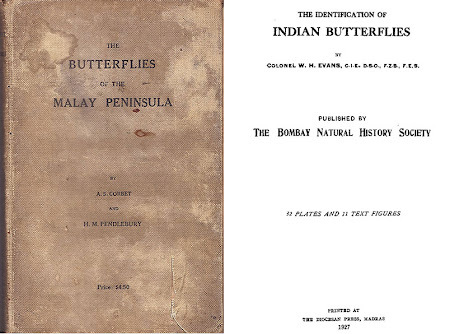 Perhaps the caterpillar host plant should be cultivated in greater numbers to aid in the conservation of this species on Pulau Ubin. 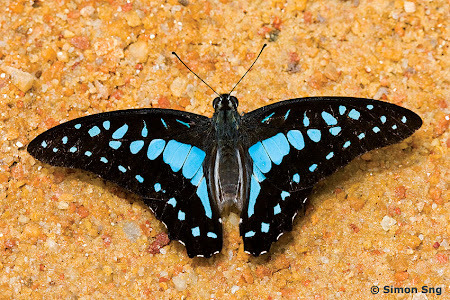 Over in Malaysia, this species has been observe to puddle on sandy footpaths that have been contaminated with animal excretions and decomposing organic matter. 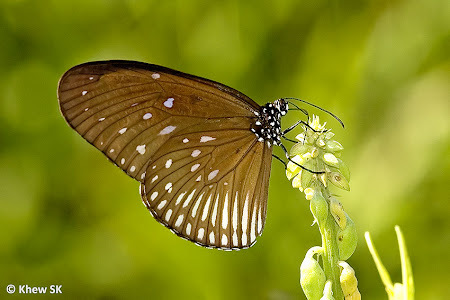 Individuals have been seen to fly around favoured spots and repeatedly return to puddle and feed at the same areas despite being disturbed. 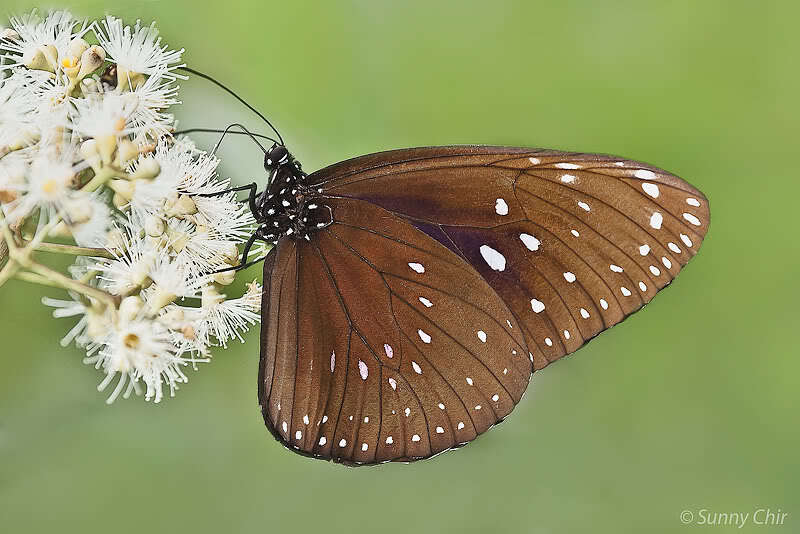 This species has not been successfully bred in Singapore thus far, although its caterpillar host plant is suspected to be a Cynanchum sp. 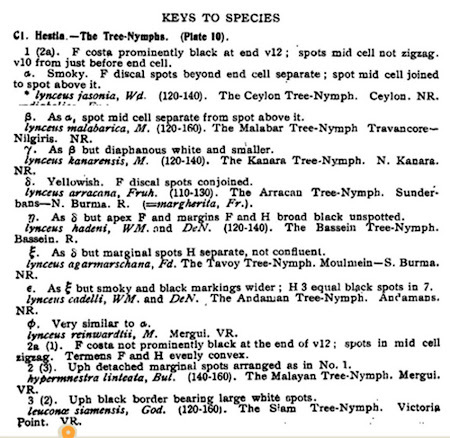 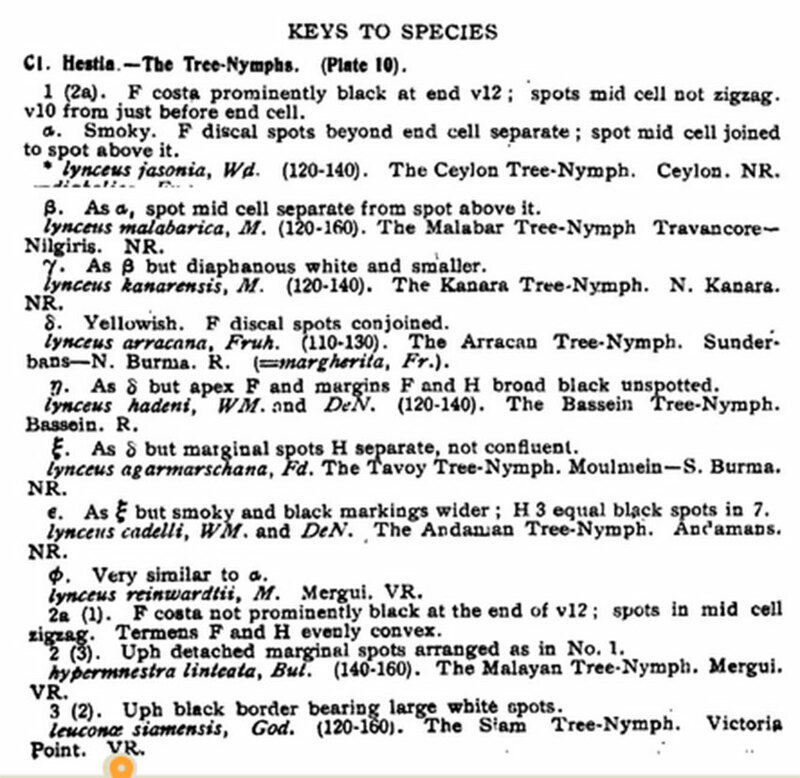 The early authors recorded the caterpillar host plants to be Malaisia scandens (Fleming) and Mikania cordata (C&P4), although the last-named plant in C&P4 may have been a mistake. 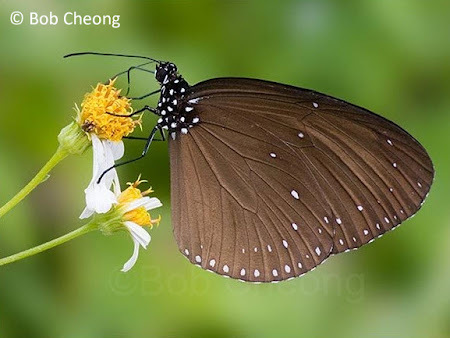 Text by Khew SK : Photos by Bob Cheong, Sunny Chir, James Chia, David Fischer (Australia), Goh Lai Chong (Malaysia), Antonio Guidici (Thailand), Federick Ho, Khew SK, Loke PF, Simon Sng and Mark Wong.